Artificial intelligence for self-driving cars. Predicting our climate's future. A new drug to treat cancer. The world's most important challenges require tremendous amounts of computing to become reality. But today's data centers rely on many interconnected commodity compute nodes, limiting the performance needed to drive important HPC and hyperscale workloads. 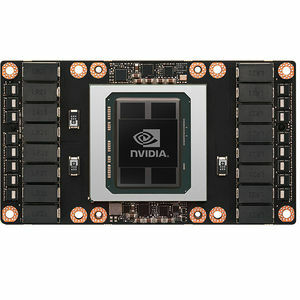 The NVIDIA Tesla P100 is the most advanced data center accelerator ever built, leveraging the groundbreaking NVIDIA Pascal™ GPU architecture to deliver the world's fastest compute node. It's powered by four innovative technologies with huge jumps in performance for HPC and deep learning workloads. The Tesla P100 also features NVIDIA NVLink™ technology that enables superior strong-scaling performance for HPC and hyperscale applications. Up to eight Tesla P100 GPUs interconnected in a single node can deliver the performance of racks of commodity CPU servers.